After European and US business newspapers (The Wall Street Journal, The Financial Times) took note of Mr Bolsonaro (the Catholic rightwing candidate for the Brazilian presidential elections in October) last week, the wider European press also noticed him after his long interview on Globo TV on Tuesday evening. Yesterday, German newspaper Die Welt (the World) asked company leaders (of Volkswagen, BMW and several chemical companies) whether they had any foreseeable issue with such a presidency, to which they all replied that it would be good if (1) Brazil could get rid of its reputation of corruption and (2) that they would do business with whomever the public democratically choose. Related coverage: <a href="http://thegoldwater.com/news/35447-God-Family-Brazil-Globo-Interviews-Leading-Presidential-Candidate-Bolsonaro">"God, Family, Brazil" - Globo Interviews Leading Presidential Candidate Bolsonaro</a>. Today it was up to AFP (Agence France Presse), the national French Press Agency and Le Monde (the World), France’s biggest newspaper, to have their say. Both publishers, who are leftwing (the only true rightwing newspaper in France is Le Figaro) and thus presented him as being far-right, admitted that ‘there is a chance that he can win, although it mostly depends on whom he will face in the second round’. Just as in France, the Brazilian presidential election is held in two rounds and therefore most political analysts said that it all will depend on the three weeks between 7 October (first round) and 28 October (second round). Although none of them truly expects the jailed former President Lula to be allowed to stand, the support of the Workers’ Party will remain an important factor, certainly in the second round. In France, it is understood that during any presidential election, the first round is voted by the public and the second by the politicians. Should Mr Bolsonaro want to rule Brazil as president over the next few years, the French media advises him to start forging alliances now. Just a clarification: He is Catholic, not evangelical. They are probably basing their analisys on our mainstream media, they use the same logic that said Hillary had 99% of winning, so you can imagine how huge Bolsonaro support really is. 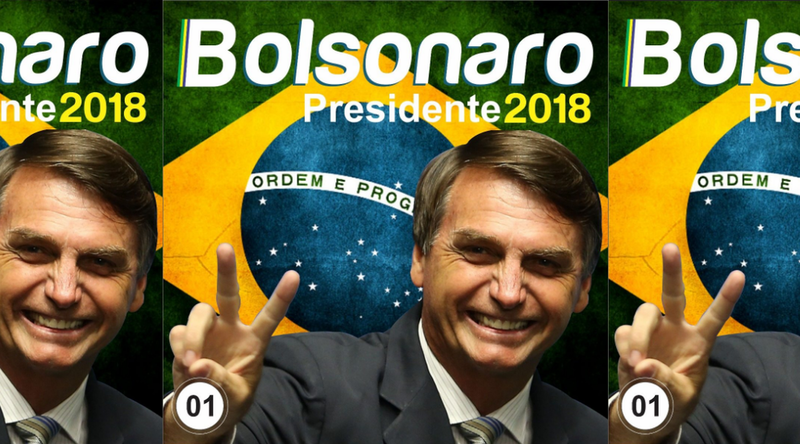 Bolsonaro already had the most chances of winning this year's election since 2016. Actually, when there was the possibility of Lula running, the chances of Bolsonaro getting elected were almost certain. Lula's rejection is huge and Bolsonaro is the anti-Lula candidate (same way he's the anti-establishment candidate). The biggest danger is, and always was, of our voting machines to be frauded in favor of the establishment. Bolsonaro had managed to create and approve a law for the mandatory printing of the electronic votes, so the vote could be conferred by the voter and used for recounting later. But the establishment managed to undo his work, ignore the law and lobby with Smartmatic so the printing would be impossible. Smartmatic has a documented history of frauds INSIDE OF OUR COUNTRY and in Venezuela. The votes should be fully manual if we were to follow the law, but, for some "mysterious" reason, our Supreme Court disagreed. And as advice: use "Christian conservative" and there will be no misunderstandings. His appeal is to all the Christians and conservatives.